Kenco is bringing a ground breaking new initiative to the small screen this August, with its ‘Coffee Vs. Gangs’ programme. Kenco is bringing a ground breaking new initiative to the small screen this August, with its ‘Coffee Vs. Gangs’ programme – part of the Coffee Made Happy programme from Mondelēz International. The advert tells the story of life in Honduras through a mix of live action and animation via the medium of tattoos, the central representation of gang culture in Central America. We see a young man on the brink of becoming involved in violent gang activity but, as the story unfolds, we see his path change as he embarks on the Coffee vs Gangs project. Coffee Vs. Gangs gives young people in Honduras the opportunity to train as coffee farmers, born out of the belief that if you care for the people who care for the bean, you get quality coffee. Kenco will work with local people from the inner city and from coffee-farming communities who may be at risk of falling into crime, and equip them with the skills they need to become successful coffee entrepreneurs – giving them a better chance of a secure future and helping them stay out of gangs. Honduras is the top coffee producer in Central America and the seventh largest in the world, and produced 3.8 million 60kg bags of coffee this season. The country has 110,000 registered coffee producers, with 92 per cent considered small producers, who generate more than 1 million jobs during the picking season – creating employment for more than 12.5 per cent of the Honduran population. The 11-month training programme, delivered alongside FUNDES and Sogimex, is part of Coffee Made Happy, a global $200 million Mondelēz International project that aims to help 1 million coffee smallholder farmers become successful entrepreneurs. The programme already works with 16,500 farmers in Honduras. Emad Nadim, Brand Manager, Kenco says: “Mondelēz International is a big player in coffee and collectively we and our consumers – who drink about 8.6million cups of Kenco a day – have a responsibility towards the communities that our coffee comes from. The Coffee Vs Gangs Pilot Project will offer an end-to-end programme from lodging, to food, to business skills, following individual stories along the way and creating true brand transparency and a step towards real sustainability. “This is an extremely exciting and potentially life-changing project on which we are embarking. The advert has a completely new look and feel to what people are used to from Kenco, but it embodies the seriousness of life in Honduras. I strongly believe this Kenco ad pushes the boundaries of coffee advertising and brand transparency, above the norm of smiling people holding steaming cups of coffee. Cadbury Hot Chocolate, the top-selling brand for convenience stores, is launching new impulse-friendly price-marked packs this April. We’ve got some news to heat up your hot beverages range! Cadbury Hot Chocolate, the top-selling brand for convenience stores1, is launching new impulse-friendly price-marked packs this April. The new PMPs2 are available across the range, including drinking chocolate, instant chocolate and Highlights, on new, contemporary packaging launched in January this year. Case sizes have also been reduced from 12 to six, making the range ideal for retailers with limited space. Cadbury is the number one hot chocolate brand3 . Research suggests that shoppers are looking for clear and transparent pricing information to help make their hunt for value easier, with price marked packs providing one possible solution4 - one third of shoppers describe clarity and transparency as the major benefit of PMPs1 . Independent retailers say that PMPs may encourage impulsive purchasing5, with the majority of believing they sell faster than standard packs5 and can be used to save time pricing in store5. Cover all subcategories. For example, for Hot Chocolate, include ‘with milk’, instant, light and cocoa. Lay out the category in format type left to right, starting with hot chocolate with milk – a key sign post for the category. Exclusively for the Convenience trade, we are launching permanent price-marked packs, (PMPs) of our successful Kenco Eco Refill coffee range. Kenco Rich, Smooth 100g (both £3.291) Decaff Eco Refill 100g (£3.591) and Kenco Millicano Eco Refill 85g (£3.291) are now available to order and pick up in your local Cash and Carry and Wholesaler. 44 per cent of shoppers walk to small stores4, so the lighter weight of Kenco Refill packaging makes sense for these customers5. Our packs look to help independent retailers to drive value sales and boost their coffee range. Why not check out our Coffee display page, for more information. 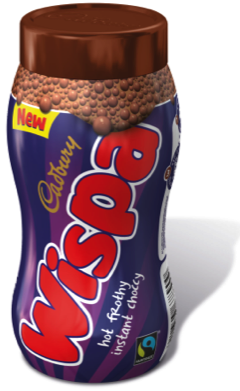 Ready and waiting to shake up your instant hot chocolate aisle, Cadbury Wispa is bringing its famous Wispa bubbles to customers’ cups across the country, with the launch of its first ever hot beverage. It’s available in a 246g jar, priced at £2.79(RRP*), and comes in outers of 6, as well as a single-serve 27g sachet, priced at £0.38(RRP*), and in an outer of 30 sticks. We are supporting the new product launch with a range of marketing activity, including TV advertising, in-store activity and launch promotions. The UK’s number one caramel-filled countline, Cadbury Wispa Gold, is set to froth up your hot beverages aisle this year, with the launch of Wispa Gold Hot Chocolate! The UK’s number one caramel-filled countline1, Cadbury Wispa Gold, is set to froth up your hot beverages aisle this year, with the launch of Wispa Gold Hot Chocolate! The new addition to the Wispa Hot Chocolate range will have the same luxurious foamy top, helping your customers to create a coffee-house experience at home, with a delicious caramel flavour. It’s available in a 246g jar, which contains nine servings and is priced at £2.79 (RRP2), and a single-serve 27g sachet, which is priced at £0.38 (RRP2). In 2013, the launch Wispa Hot Chocolate brought some much needed excitement to the instant hot chocolate market last year, and was instrumental in driving the category back into growth. Wispa Gold Hot Chocolate, looks to continue this trend, by making it quick and easy for your shoppers to prepare a delicious drink, simply by adding hot water. Carte Noire Instict, the first wholebean instant from Carte Noire.